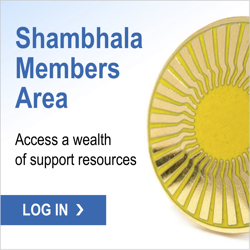 Membership dues help sustain the activity of the Victoria Shambhala Centre, allowing us to offer meditation, community events, and programs throughout the year. Monthly support also allows us to create and maintain a home for our practices and our community, and to create and model an uplifted environment that supports our practices and the Shambhala path to awakenment. Our members have diverse means and so they can offer a wide range of monthly dues. No one is excluded from membership because of money. However, making a financial commitment is a very important step along the Shambhala path; it is a gesture of support to the rest of your Shambhala community, and a clear acknowledgement of the value that you feel Shambhala has in your life. Another way is to think about your general spending patterns, especially impulse spending, and see if you wish to change anything in order to make a monthly contribution to help others experience Shambhala. A further way is to look at your monthly or annual income and consider contributing a fitting percentage of that. If you have any questions about membership dues or any other aspect of membership, please contact Susan McConnell at bodhithaye@gmail.com.